Not one of Caravaggio's largest works, but the sense of drama is intense and dynamic. There are 3 distinct parts to this painting: the group of figures seated around the table, Christ and Peter on the right and above them opened window (a device often used to signify an entrance). 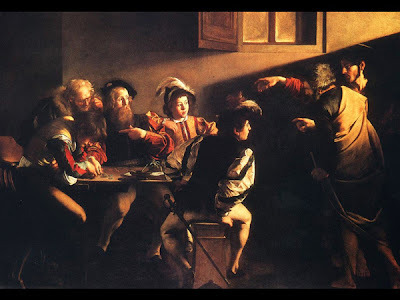 Apart from the physical structure of the composition, Caravaggio's understanding and use of light and shade (chiaroscuro) ignites the drama and projects the story at the moment Christ calls: 'follow me'. The hand that points across the room, is echoed by Matthew's hand pointing to himself (in a what me gesture).